About 15,000 people, mostly migrants from rural districts, swarm platform number two of a Kolkata suburban train station, desperate for any work in a depressed economy. The daily wagers, mostly unskilled and semi-skilled, find it increasingly hard to find work. I read this article and found it very interesting, thought it might be something for you. The article is called How West Bengal Is About To Lose Its Demographic Opportunity https://www.indiaspend.com/how-west-bengal-is-about-to-lose-its-demographic-opportunity/. Kolkata: The son of farmers for whom farming was no longer viable, Tapan Das left home 20 years ago. Today he is 42, illiterate, earns about Rs 4,000 a month working on construction sites--Rs 3,000 if you deduct the rent he pays for a mud house without electricity and water in an illegal slum. Sometimes, his wife and he survive on fena bhaat, a watery, boiled rice. His two children get a more nutritious lunch at the local government-run anganwadi or creche here in India’s 7th most populous city. “I and my wife, somehow we manage,” said Das, as he anxiously scanned platform number two at Dhakuria railway station in southern Kolkata, waiting for a labour contractor to offer him a job for the day. Tapan Das and his wife sometimes survive on watery, boiled rice. When farming failed, the illiterate son of a farmer left home 20 years ago. Today, he earns Rs 4,000 a month as a casual labourer. There are about 15,000 others like Das on Dhakuria’s packed platform two, mostly men of “working age”--as demographers call them--aged between 20 and 59, and some women older than that. Their common desperation for any kind of work represents the drop in opportunities after Prime Minister Narendra Modi announced demonetisation in November 2016. It also lays bare the closing of an opportunity for West Bengal and five other states to cash in on India’s demographic dividend, the economic growth that accrues from a large working-age population. India’s demographic opportunity stretches longer than any other country, from 2005-06 to 2055-56, but falling fertility rates mean the window of opportunity for two states (Kerala and Tamil Nadu) is closed. For West Bengal, Delhi, Telangana, Andhra Pradesh, Gujarat and Punjab, it is “closing now”--2021 being the outer date--according to a 2018 United Nations Population Fund (UNFPA) report. The jobs crisis is one of India’s leading election issues as the country heads into general elections during the summer of 2019, as IndiaSpend reported on March 26, 2019. Although West Bengal created most jobs among Indian states over seven years to 2012, according to a 2018 World Bank report, this was not enough to provide livelihoods for millions of unskilled or semi-skilled workers pouring out of the state’s rural areas and from the poorer neighbouring states of Bihar, Jharkhand and Orissa. This is the fifth of an 11-part series (you can read the first part here, second here, third here and fourth here), reported from nationwide labour hubs--places where unskilled and semi-skilled workers gather to seek contract jobs--to track employment in India’s informal sector. This sector, which absorbs the country’s mass of illiterate, semi-educated and qualified-but-jobless people, employs 92% of India’s workforce, according to a 2016 International Labour Organization study that used government data. By delving into the lives and hopes of informal workers, this series provides a reported perspective to the election issue of employment and ongoing national controversies over job losses after demonetisation and the implementation of the Goods and Services Tax (GST). The number of jobs declined by a third over four years to 2018, according to a survey by the All India Manufacturers’ Organisation, which polled 34,700 of its 300,000 member-units. In 2018 alone, 11 million jobs were lost, mostly in the unorganised rural sector, according to data from the Centre for Monitoring Indian Economy (CMIE), a business information service. West Bengal’s unemployment rate in November 2016--a month after demonetisation--was 7.3%, rising to 8.8% in February 2018 and recovering to 6.1% in February 2019, according to CMIE data. These data do not adequately capture the daily search for work. Despite visiting Dhakuria station every day, Das managed to find work for only 11 days in January 2019 at Rs 350 per day. The crowd around him was a mix of skilled, semi-skilled and unskilled workers, most of them--like Das--from South 24 Paraganas, more than 60 km south of Kolkata. While some skilled labourers at Dhakuria station found employment through connections with other workers and labour contractors, others adopted a different route: displaying their tools on the platform, publicising their expertise as craftspersons and masons. 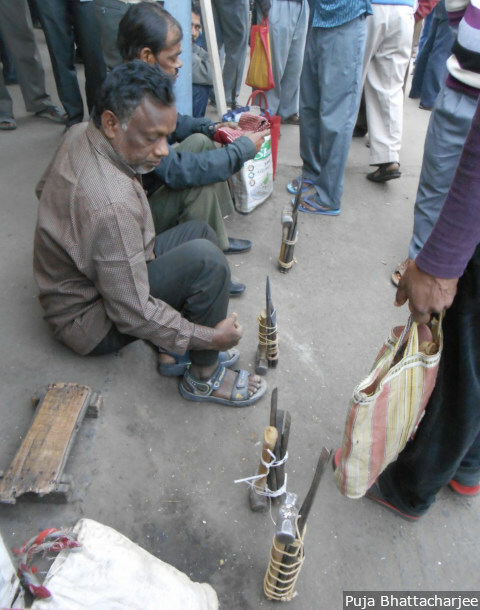 Daily wage workers display their tools, publicising their expertise as craftspersons and masons on platform number two of Kolkata’s Dhakuria suburban train station. On average, unskilled workers earn between Rs 350-Rs 400 per day, whereas skilled workers such as masons and welders earn between Rs 500 and Rs 600. While wages have not changed much since demonetisation, thanks to trade unions--weaker than they once were but still functional--the number of jobs have reduced, said experts. West Bengal is India’s sixth-largest state in terms of economic size, with a gross state domestic product of Rs 11 lakh crore in 2017-18, according to the India Brand Equity Foundation (IBEF), a commerce industry trust that promotes the government’s Make in India programme. The state would seem to be reasonably placed to exploit its demographic dividend--its 17.8 million young people aged 15-24, and growing as more workers join from poorer, neighbouring states. However, an increase in gross domestic product does not always lead to job growth, explained Saikat Maitra, assistant professor of public policy and management at the Indian Institute of Management, Calcutta (IIM). Indeed, real wages in India grew only 1% annually over 30 years to 2013, as India failed to create “decent jobs” and increase income, said a March 2019 report from Oxfam, an advocacy. In West Bengal, it does not help that industrialisation has withered, even as swarms of young men flood labour markets. As of 2017, West Bengal had 15 million unorganised-sector workers, mainly in labour-intensive industries, with construction at the forefront. With a slowdown in construction following demonetisation and new real-estate regulations, the working-age population with basic skills is the first to suffer. Without unions to intercede for them, thousands of informal workers--many illiterate like Das--are at the mercy of the market. Unions in fact played a role in the departure of industries from West Bengal. Industrialisation has also been “dismal” in the state, said Rangarajan. Until a few decades ago, Bengal had a variety of industries, such as manufacturing of engineering parts, textiles and chemicals. However, the “big companies” have since exited Bengal owing to “Naxalism, industrial unrest of the ‘80s and ‘90s and bandh [shutdown] culture”, said Rangarajan. Some of the companies that left were Brooke Bond India, ICI India, Shaw Wallace, JK Tyre and Philips India. It is left then to the informal, small-scale sector, where wages are lower and jobs more uncertain, to pick up the slack. West Bengal had 5.2 million medium and small enterprises (MSMEs) in 2017, the highest nationwide. The government realises the importance of MSMEs, but its efforts do not match the scale of the employment problem. The Trinamool Congress has been ruling West Bengal since 2011, after unseating the Left Front whose rule lasted 34 years. Before winning the state elections, the Trinamool in its 2011 manifesto promised to revive West Bengal’s economy by focusing on the development of MSMEs, restarting and remodelling closed PSUs (public-sector units or enterprises) and attracting large investments in manufacturing, textiles and other sectors. In 2016, the state government launched Startup Bengal to encourage and fund MSMEs. But between January 2016 and April 2018, the state provided financial incentives to no more than 15 start-ups. The situation is made worse by the slump in construction, which absorbs the largest number of workers who are illiterate, unskilled or come off farms, in West Bengal. Real estate growth in West Bengal has not picked up after demonetisation, according to a 2018 report by Knight Frank, a realtor. Residential sales in Kolkata were at an all-time low in 2018, and buildings in southern Kolkata, which were once favourites among home buyers, are now empty due to a lack of buyers. The general consensus among the crowd at Dhakuria station is that the job market has been slow for between six months and two years. By 10 am, the platform is nearly empty. “If we don’t get work by 9 am, we go back home,” said one. That means a day of lost wages and wasted expense on public transport. Most job seekers have railway passes, which cost Rs 100 to Rs 300 per month depending on the distance they travel. The picture that emerges is of a vast, largely unskilled--and ageing--workforce that lives on a razor’s edge. West Bengal’s fertility rate is 1.6 children per woman--among India’s lowest, lower than Kerala’s 1.8 and below the replacement rate of 2.2--which means the state is not producing enough children to keep the population stable. Migrants may fill in the gaps, but they, as we said, tend to be from poorer states, so West Bengal’s economic growth is likely to be unsustainable. Monara Bibi, in her early 60s, was one of the few women at Dhakuria. Her saree, earlier white, was covered with patches of grey due to prolonged use. Her husband was no more, and she has three sons and a daughter. To support her family, Bibi has visited platform two for the last 20 years. She lives in Joynagar, about 50 km from the railway station, in a mud house and commutes by train about thrice a week, paying Rs 200 for a monthly pass. While her sons pitch in with the household finances, Bibi still visits Dhakuria looking for work. “I do it to financially support my daughter,” said Bibi. Her son-in-law is unemployed. Bibi was unsure how long she might be able to continue working--maybe another year and a half, she said. As a skilled painter and mason, she earned Rs 500-Rs 600 a day, but there is no assured work. “Many times, the labour contractors don’t engage me thinking I am old and frail,” said Bibi. From 25 days a month of work, she gets 10-12 days now, earning about Rs 5,000-Rs 6,000 per month. Next to Bibi was Jharibala Mondal, also a painter and mason, also in her sixties, also here for the last 20 years and also reporting that she found jobs 10 days a month, down from 25. The only wage earner in her family, she talked about her handicapped husband and son and how she feels the responsibility to “work as long as she can”. In an effort to survive, some workers have established contact with various syndicates operating within the city. These syndicates are usually run by local strongmen with connections to the ruling party and administration, according to Biswanath Chakraborty, a psephologist and political science professor at Rabindra Bharati University in Kolkata. In the 1990s, various farmers and landowners were left without a source of income when the Left Front government acquired land for the Rajarhat Township on the northeastern fringe of the city. To placate them, in addition to compensation, the government offered them employment in the form of a syndicate, Chakraborty explained. These syndicates were designed as informal cooperatives that supplied construction material to real-estate developers. A local painter and plaster contractor from the syndicate, on condition of anonymity, said he owed his livelihood to the Trinamool Congress government due to the syndicate system. All his labourers--about five to 15 men--come from Dhakuria station and are each paid Rs 400 per day. Nirmal Maji, West Bengal’s minister of state for labour, dismissed the allegations against the syndicate system’s corruption by goons were “bogus". He said the Trinamool government’s Samajik Suraksha Yojana, introduced in 2017 to provide social security to workers in the unorganised sector, was "a historic legislation.” This scheme provides various benefits, including provident fund, health coverage for workers and their immediate dependents, compensation in case of disability or death, education for workers’ children, and training in safety and skill development for all registered labourers in the unorganised sector. The number of beneficiaries is not clear. Mason Amit Singh is one of the lucky ones. 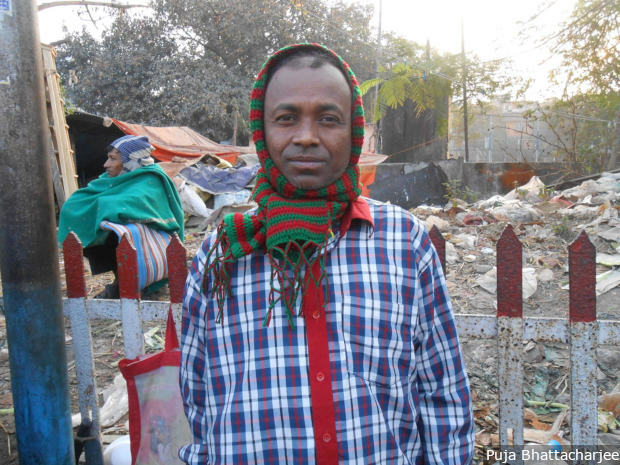 He travels 20 km from Howrah to a labour hub near the Ruby Hospital bus stand to find work with one of the local syndicates, whom he met four years ago. Although he finds regular work, travel and food consume Rs 100--a quarter of his daily earnings--and there is little left to make a fresh start in life. The son of a van driver with an unstable income, Singh is 32, at the prime of his working life, but with few prospects of a better life. As workers like him dominate the working-age population, and industries stay away, some market forces in West Bengal, said experts, are being substituted by political organisations. At Dhakuria station, Madan Goldar, secretary of the All India Trade Union Congress (AITUC), proudly declared that his AITUC unit had 5,000 members and cared for “each worker” on the platform by offering assistance during health emergencies, crimes and more. The workers contested this and said memberships were forced. “We have to make regular monetary contributions to the union treasury,” said one worker on condition of anonymity. “They ask for Rs 50, but how can we pay if we don’t get work?” Others said they register to avail small benefits and remain in the union’s “good books”. The first labourer said the union refused to let anyone stand at the station if they did not contribute. In its 2014 Lok Sabha election manifesto, the ruling Trinamool Congress had talked of the National Yuva Vista, a plan for rural and urban youth across India. It had promised housing, education, health, skill development and employment programmes for the poor. It is 2019, and as West Bengal prepares for general elections on April 17, 24 and 30, and May 7 and 12, there appears to be no attempt to reclaim the demographic dividend. “In West Bengal, muscle power is more important than economic prosperity,” said Chakraborty, the psephologist. Without prosperity, there are only unrealised dreams. This is the fifth of 11 reports. The previous stories from: Indore, Jaipur, Perumbavoor and Ahmedabad.